iPhone device does not ask for a code. So unlike other services we offer on www.UnlockPhone.codes, instead of receiving an unlock code, you will be receiving an email that confirms your iPhone is unlocked. All products, and company names, logos, and service marks (collectively the "Trademarks") displayed are registered® and/or unregistered trademarks™ of their respective owners. 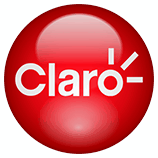 www.UnlockPhone.codes is not associated with or sponsored by Claro. The authors of this web site are not sponsored by or affiliated with any of the third-party trade mark or third-party registered trade mark owners, and make no representations about them, their owners, their products or services.